The plot thickens. 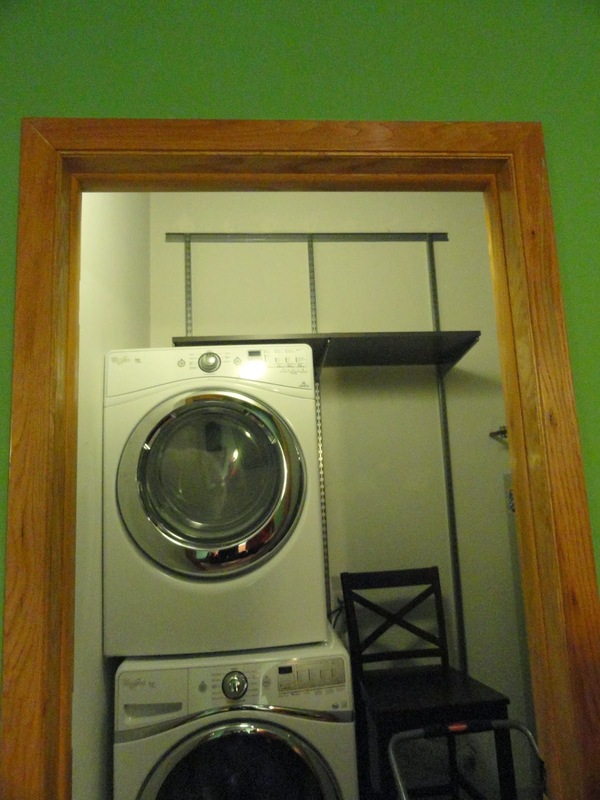 After a week with our new washing machine in place, it was time for another weekend full of laundry room projects! 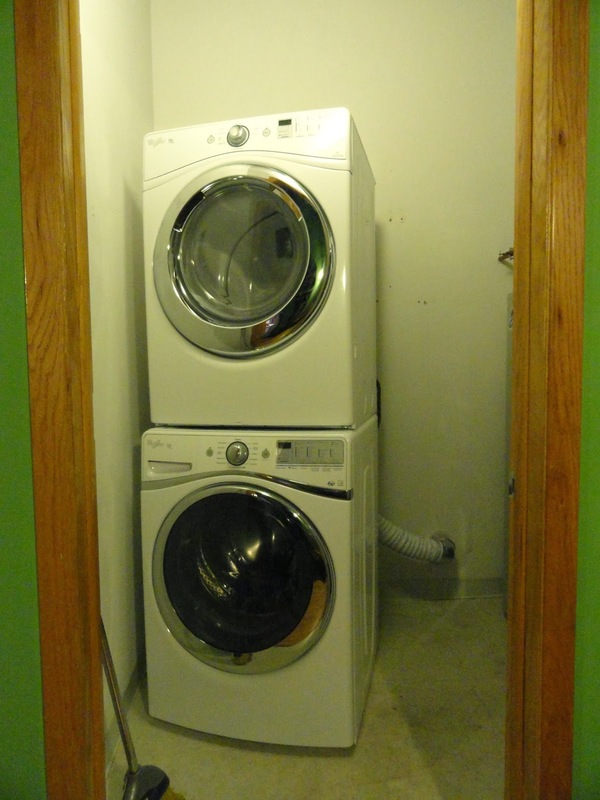 First up, the dryer. I mentioned in the last post that we didn't want to attempt to install it ourselves and chance messing up the gas line. I found a few local appliance repair shops in the area via Yelp and called for quotes. A couple didn't even do installations, which narrowed down my search. 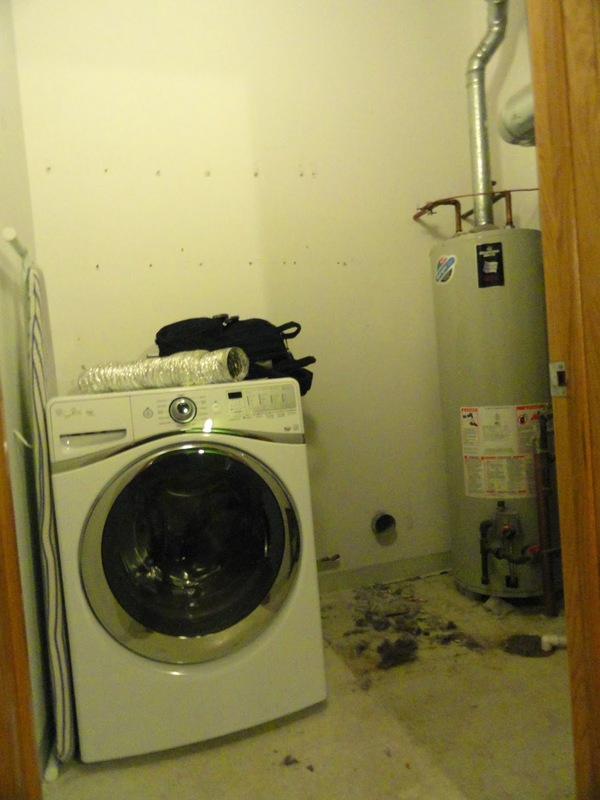 After a couple days, we had someone booked to come out to get our old dryer disconnected, new dryer fixed up and the vents cleaned out. Bright and early on a Saturday morning, the old dryer was moved out of its home and put in temporary storage in our garage space. The floor was swept up and later bleached and mopped to match the left side which got the same treatment the week before. This also allowed me to reach all of the water heater pipes to give them a good dusting with a wet cloth. Years of dust had built up back there. But don't say we didn't reap a reward for all of the work. A dollar twenty seven found in the debris. Our new dryer has a steam function, so we hooked up an extra hose from the cold water tap using a Y connector we picked up at Home Depot. A new dryer vent hose was added, the gas line turned back on and Bob and the technician lifted with their legs to get the dryer stacked on top of the washing machine. The room was starting to come together! It turns out those model numbers are even sneakier than I originally thought (recall we bought different models washer and dryer from separate online sources). 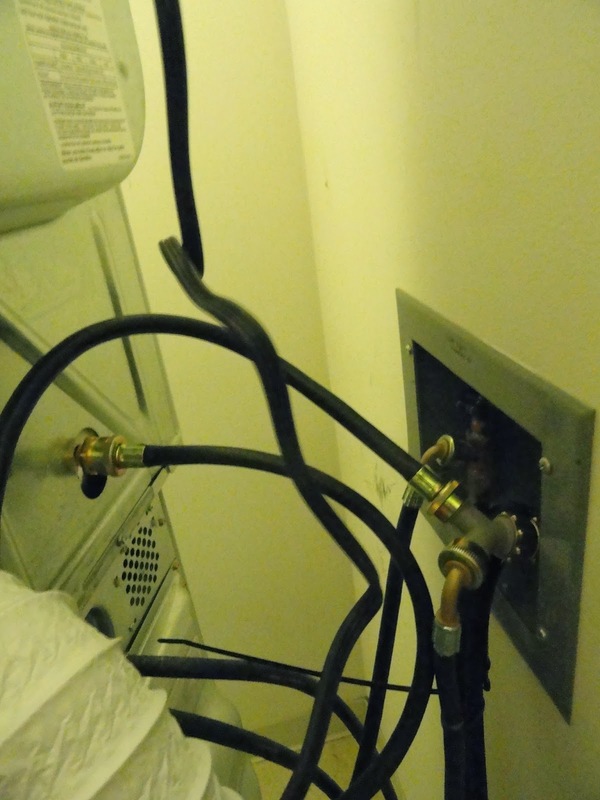 I had ordered a kit to secure the appliances together from the back, for safe stacking, but it turns out the connector was a little on the short side. A follow up order to Amazon was quickly placed. 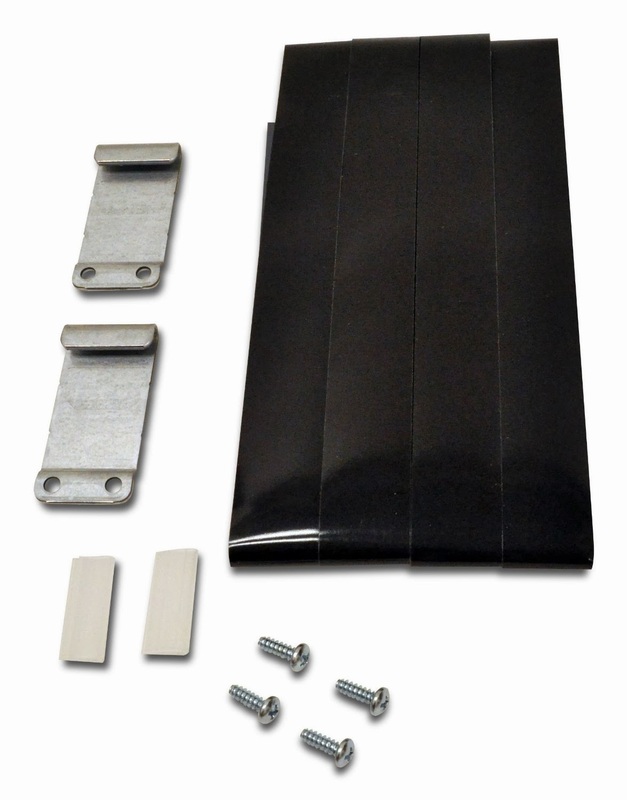 This part is yet to be done, but key to helping keep our dryer in place. Okay, now onto the fun part: The Container Store's elfa sale! 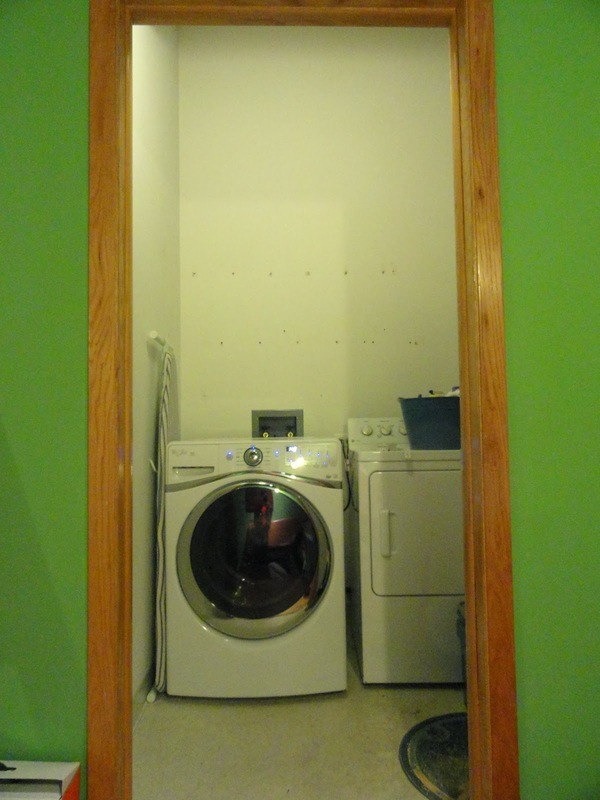 We measured and configured to create a plan for how many shelves we could get to store the most stuff in our new and improved laundry closet. 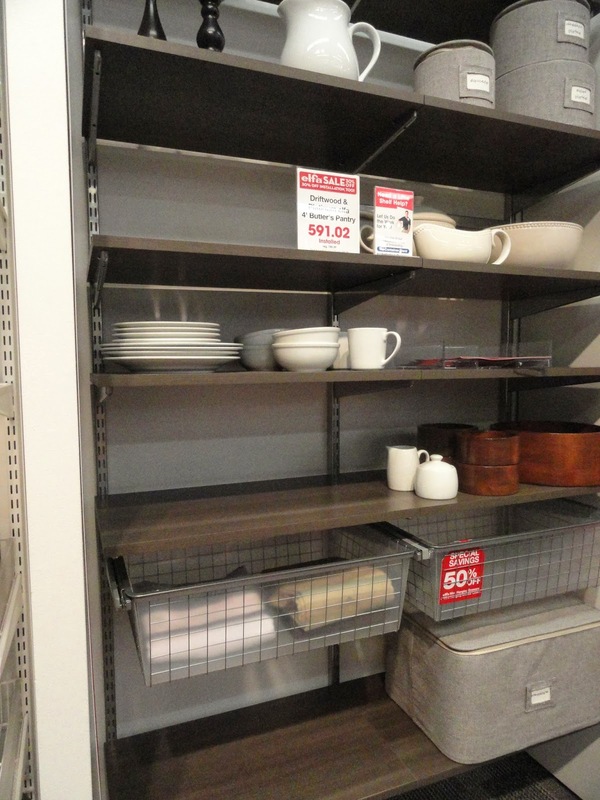 We walked into the Container Store expecting to buy white shelving, but after seeing it in action, we had second thoughts. The appliances were white and the walls were white. How much whiteness could one handle? 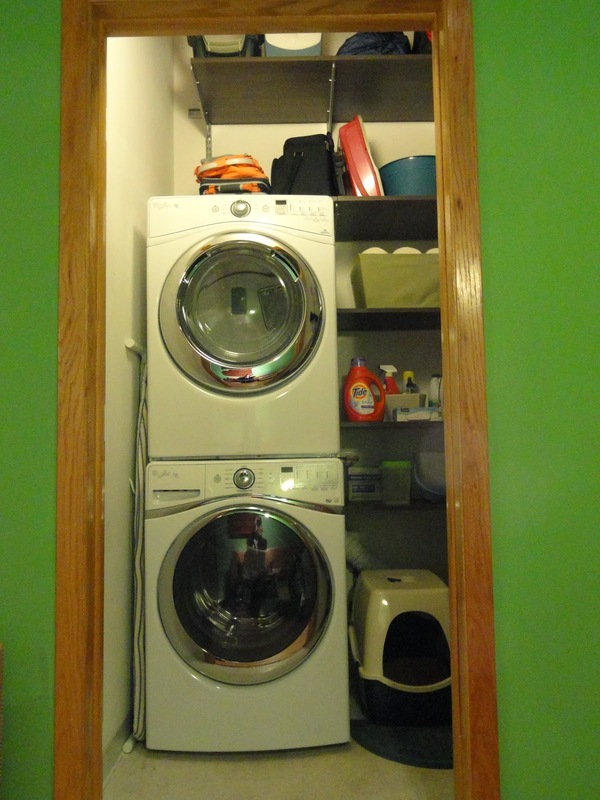 The grayish brown tones would add a bit of color to the laundry room, without going overboard. We sketched out our needs and sent the worker to the back to load all of our new shelves up! We saved over $100 with the 30% elfa sale going on, which clocked us in at about $260 before taxes for all of these goodies. Although we think we are going to return one of the shelves, as we ended up liking how spaced out the three smaller sized ones are. We got it all home and started to unwrap our goodies. Bob pencil marked how high the top track should go and the hardest part of the job began. We found that a few of our attempts to drill thwarted, and it took Bob several tries and our masonry drill bit to get the job done. 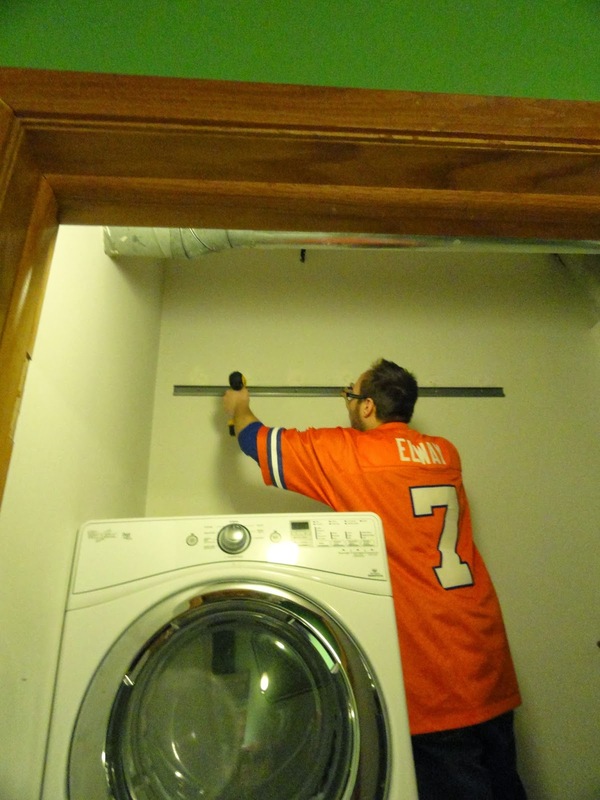 Fun fact: it was Superbowl Sunday, hence the Elway jersey. Sadly, Bob's Broncos could not deliver him the win that evening. One little outlet made most of the track placement decisions for us. The outlet is placed smack dab in the middle of the wall, which meant the metal track for hanging the shelves had to go on either the left or right side of it. Too far to the left, and it would be behind the washing machine. 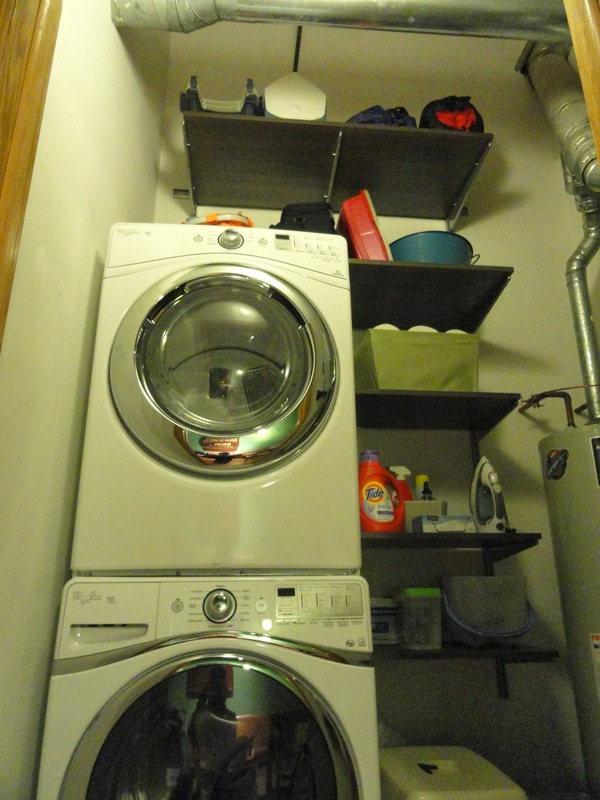 Too far to the right, and the shelves would run into the water heater. So we had one exact spot that we could start our shelves at. After that, though, it was quite simple. The hangs were hung, the brackets were bracketed and the shelves were shelfed. We played around with the heights a bit, thinking about what would go on each shelf. We could have gone even higher for the top shelf, save for us not being able to reach anything we put up there even with a step stool! 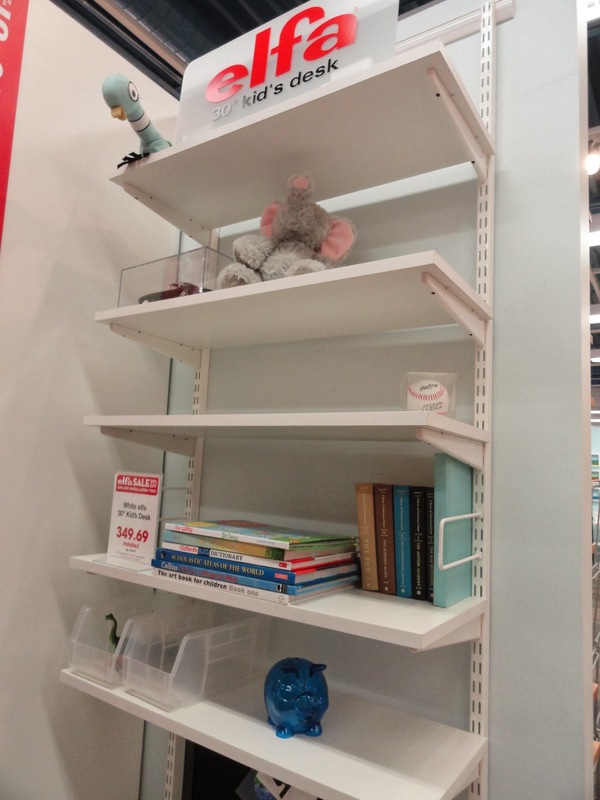 Then came the shelf styling! We knew the cat litter box would go on the floor underneath the shelving, so the bottom shelf (as low as it could go because of the dryer venting and gas line) hold our scoop and whatnot for cleaning out the box. The next shelf up contains cleaning products and laundry detergents. 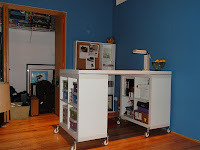 I used a blue and cream hue-d bin bought at Target a long time ago to hold most of the stuff, aside from the main stuff we always grab. Finally, a place for our bulk buy of paper towel! I robbed from Peter to pay Paul by dumping out a green canvas bin of hats to hold the extra rolls. I eventually found another bin to hold onto our hats, so they only stayed dumped out on our closet floor for a few hours. Next up, the real "long term" storage begins. 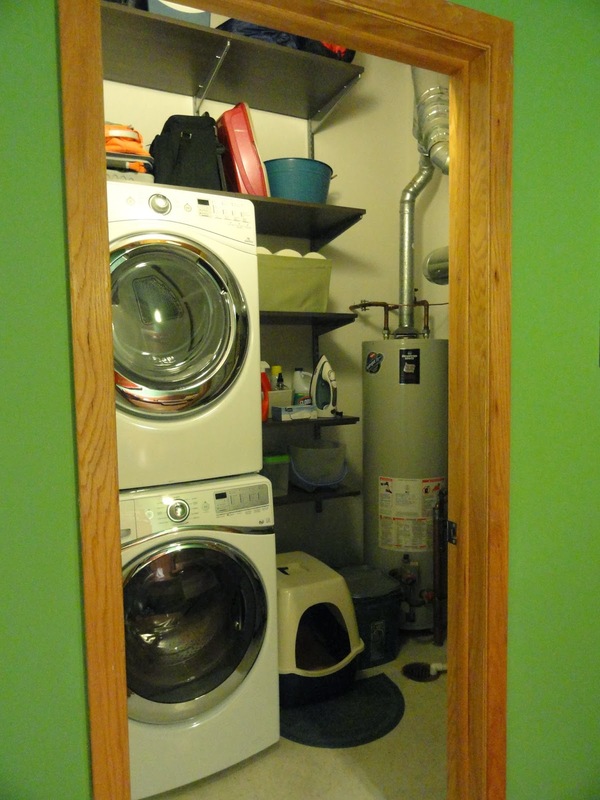 Above the dryer we have various coolers, aerobed, sleeping bag and cat carriers. Things are pretty spaced out at this stage, leaving us plenty of room for more. With everything in place, the room had finally taken shape! In retrospect, we probably could have gotten away with 30" shelves across the top left as opposed to 24". However, with our outlet issue in mind, it would have been cutting it extremely close to the wall edge, so we are thinking we are better off having bought the way we did. This also allows us to buy something very skinny and very tall to lean against that edge. Hmmm. . .what would it be? But wait, there's more! 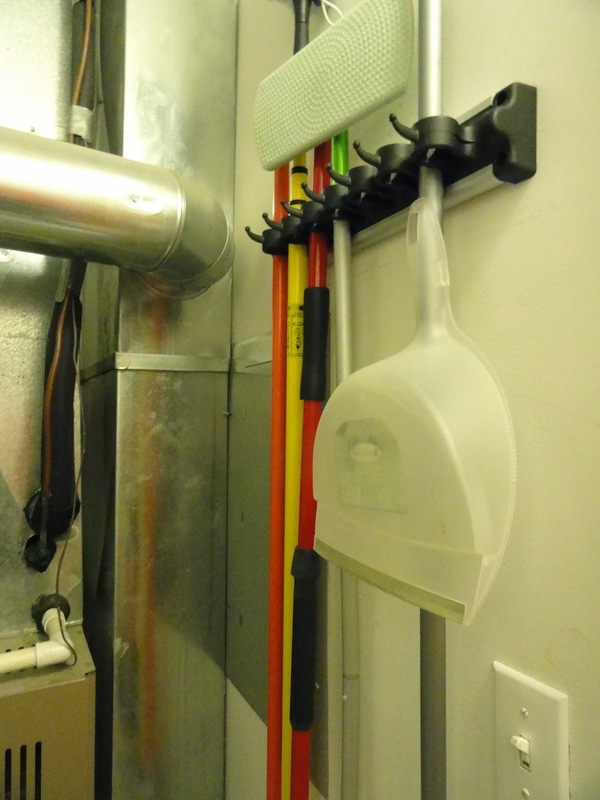 Not wanting to deal with brooms and mops lazily leaning against the inside wall, we looked for hanger options to keep them in place. The Container Store gave us this heavy duty beauty, the Grook, for $20. We got it up on the wall and quickly filled in the slots with our cleaning tools. What makeover post would be complete without a before and after shot? The only things outstanding are a hook system to hang up the ironing board, and placement of some art on the left wall to color things up a bit. Stay tuned for developments there, but in the meantime - won't you join me on my entryway bench as I stare at my new laundry room? ?